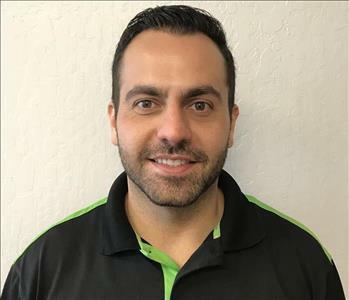 Arin Bagheri is the Operations Manager at SERVPRO of Campbell/Los Gatos/Monte Sereno. 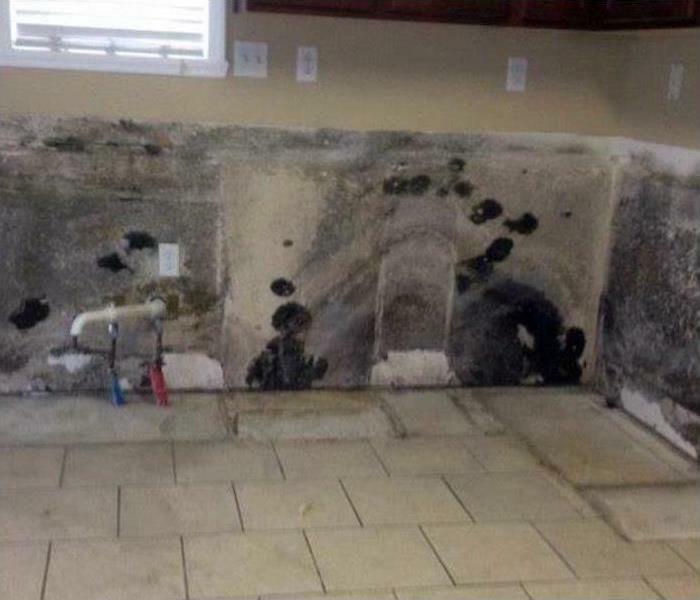 He has been working with this branch for 12 Years, and has the following certificates from the Institute of Inspection Cleaning and Restoration Certification (IICRC):Water Damage Restoration, Carpet Cleaning, Fire & Smoke Restoration, Mold Remediation, and Applied Structural Drying. 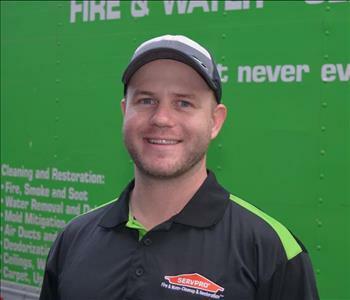 William is our Construction Project Manager at SERVPRO of Campbell, and he was born and raised in Australia. He has a construction background since about 2005 and loves to travel. His favorite sport is Rugby, and he has a love for ice hockey. For years he worked in kitchen remodels, woodworking, and general carpentry. His hobbies include golfing, traveling, and watching his favorite sports team Rugby (Brisbane Broncos) and for Ice Hockey (San Jose Sharks), a little more local. Ronald is our Production Manager at SERVPRO of Campbell. He is the senior production manager and estimator, a local boy, born and raised in the south bay (Santa Clara.) Ronald been in the industry for five years and started working in the warehouse and loves his work so much that he is striving to work his way to the top. He now oversees all field operations, inspections, and estimating and loves his job! He looks forward to tackling each new assignment as they are always different and each day brings something new. Ronald is proud to be able to walk each customer through the steps that are needed to mitigate the job suitably during such a stressful time in their life. He prides himself in customer service and tries to make it the best experience possible. 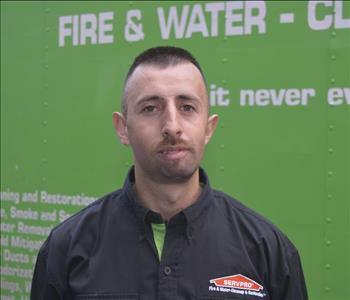 Prior to working here at SERVPRO, Ronald was in the telecommunications industry. His following Certifications – Water, Fire & Smoke, Odor Control, and Carpet Cleaning keep him learning as he works towards more Certs! He is a proud father and loving husband, and his family is the most important thing in his life! When not working time is spent snowboarding, camping, the beach and spend time at the lake with his loved ones! Allison is the Sales Marketing Manager at SERVPRO of Campbell/Los Gatos/Monte Sereno. She has 8 years experience in the construction/painting industry with previous roles in project management and sales/customer service. She is a Bay Area Native, and enjoys spending time with family and friends in her free time. Robert is a Sales and Marketing Representative at SERVPRO of Campbell. He has numerous years of management and restoration experience. His duties include finding new accounts and overseeing some of our key clients. He also designs sale and marketing strategies to drive business while still providing excellent service. Robert is always working to increase our reach in the community. He enjoys spending time with family, traveling and classic cars. 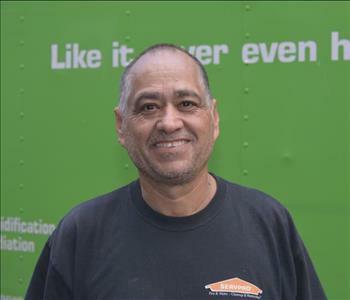 Carmen is a Production Crew Chief at SERVPRO of Campbell and was born in Mexico. She has been working in the industry since 2008 and enjoys her work. Before restoration, she worked at Target and loves every part of this industry. She is happily divorced, and the mother of three and speaks Spanish and English. Carmen enjoys, when outside of work, running, playing basketball, and kickboxing. When she is not working, spending time with her kids, and going to the movies with them is at the top of her list. 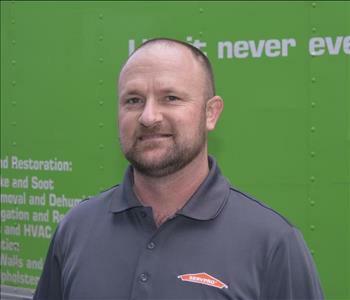 Sean is a Production Crew Chief at SERVPRO of Campbell and was born and raised in San Jose, CA. 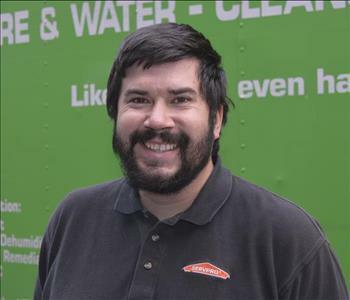 He has been with SERVPRO since 2013 and has been certified by the IICRC in Water and Carpet/Upholstery Cleaning. He enjoys doing this because he can give a hand to people in their time of need. He takes great pride in his work. Sean has three nieces and one nephew from 2 older sisters with a loving family. He enjoys his free time by staying active playing sports, going on camping trips, hiking, riding motorcycles with friends, and partying at music festivals. 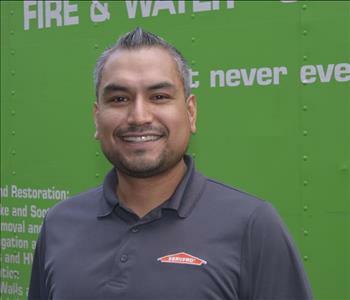 Raul is a Production Technician at SERVPRO of Campbell and is originally from Durango, Mexico, where he has some land and a Farm. 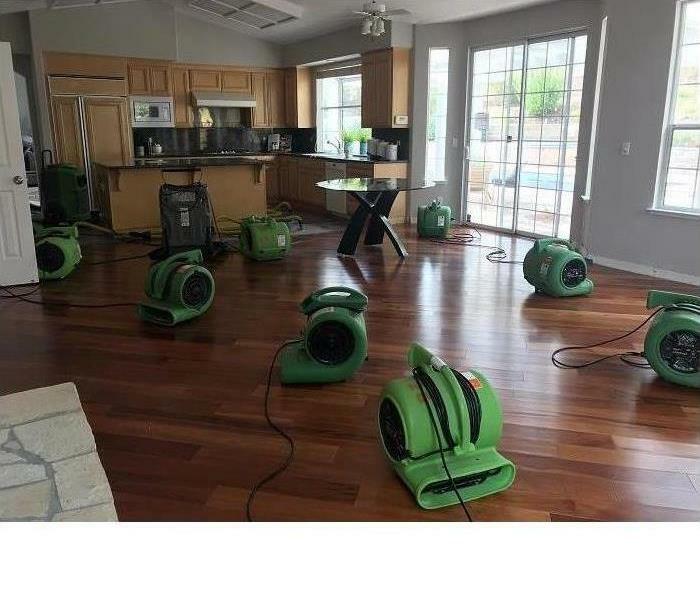 He has been doing restoration with SERVPRO since 2015, and really enjoys the new things he does daily. He likes to help people when they are in need. Before becoming involved in this restoration industry, he was a mechanic and had a couple of shops. When not on the job, he likes to work on my home, and his car. Once a year, he drives back home to Durango and spends a month there with his family, and friends. Christopher is a Project Manager at SERVPRO of Campbell and hails from Mexico City and is a first generation Immigrant. He has been here since 2010 and most of those years as a Crew Leader and Manager. Previously, he was a department manager for The Home Depot for six years and has experience with graphics/web design freelancing and Certifications: WRT (water damage Restoration), FSR (Fire & smoke restoration) ASD (Applied Structural Drying) and Bio-hazard Clean Up. What Christopher enjoys most about the industry is everyday challenges, and “using science to do my work, I can't go wrong that way”. - He is a proud parent of a 6-year-old Princess and is bilingual in Spanish and English. His hobbies are working out (weight lifting), attending live concerts/performances, and of course, spending time with his daughter. Customer service is his main goal, and focus and has experienced small to large commercial losses through the years. He started in this industry as a fire technician (lowest position) and has worked his way up to his current position. 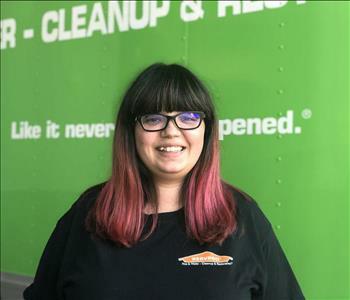 Christina Faria is the Administrative Assistant at SERVPRO of Campbell. She has been with the company since 2015 and was born and raised in San Jose and enjoy spending time with her family, watching movies, reading, and trips to the beach. -Christina has been happily married since 2017. 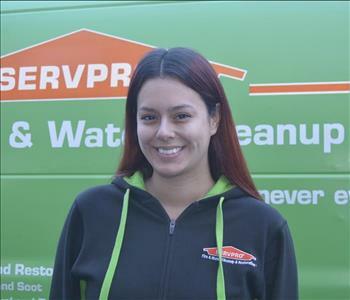 Alyssa is an Estimator and a Project Administrator here at SERVPRO of Campbell since 2015. She is IICRC certified in WRT water damage restoration and works closely with the project managers in getting billings out promptly as well as manage all daily corporate uploads. She loves making customers feel at ease and happy with our services. Alyssa is from San Jose and enjoys spending time with her little family and relaxing on the weekends. 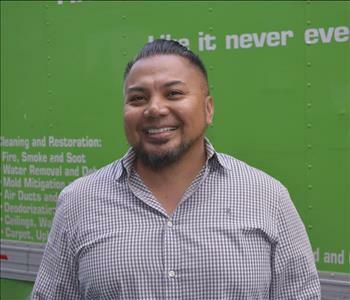 Juan is the Construction Foreman of SERVPRO of Campbell and hails from Morgan Hill, CA and has been in the industry since February 2018, and before landing here, he was a house painter for 8 Years. The reason he enjoys working at SERVPRO is helping people restore their property the right way. He has been married since 2012 to a wonderful stay-at-home wife that does an amazing job on raising their daughter. He speaks three languages; Spanish, English, and Sign Language. Juan enjoys challenges and learning new things on a daily basis. 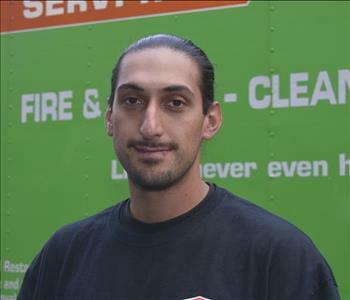 Nicholas is a Production Technician at SERVPRO of Campbell and was born and raised in San Jose, CA. He has been in the industry from 2018 and greatly enjoys the labor. Before working in the restoration industry, he worked for Tesla. He has earned his IICRC water damage certificate and enjoys helping people. Nicholas has three boys and enjoys going to Oakland Raiders Games, working on cars, ATV riding, and taking his sons to the baseball games.